If you are already using school bags and would like a price comparison, please contact our sales team who will be happy to help you. You will be surprised how much they could save you! Either gloss white, gloss black or gloss silver magnetic bottle boxes now available from stock in single packs. The new boxes are made from rigid 1000mu board, supplied flat packed with a magnetic hinged lid and removable self adhesive taps. Ideal for holding either 1 bottle of wine or spirits for presentation. Note, you will need to use an external carton if you wish to send this box through the post. Printedbottle magnetic boxes available from just 25 boxes printed 1 or 2 colours (simple design). Standard lead time on printed gift boxes is within 2 weeks from approval of artwork and order. 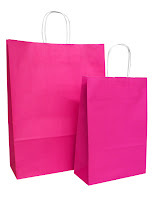 We have introduced 3 new colours of paper carrier bags with twisted handles to our range. The new fuchsia and chocolate paper carrier bags have white twisted paper handles, and are available in 3 useful sizes 180mm, 220mm and the 320mm. Our sunfloweryellow paper carrier bags also have white twisted paper handles, however they are only available in the 220mm and 320mm sizes. The new paper carrier bags are available as printed bags from as few as just 1 box . Our standard lead time on printed paper carrier bags is within 2 weeks based on a simple 1 colour design, multi coloured or complex designs are produced before the paper is converted, minimum 3000 bags based on a lead time of approx 8 weeks.